WineRocks Capt. Geech & the Shrimp Shack Shooters – DFV WineRocks! Six completely unique musicians make the success of CG. Short, tall, fat, skinny, bald, young and old, this band warmly refers to themselves as a “band of misfits”. The love they have for each other is an obvious energy on stage. Band Leader and founder J Bird and his bandmates have performed all over the U.S. over the last ten years, playing hundreds of fairs, festivals, corporate events, nightclubs and family owned taverns. 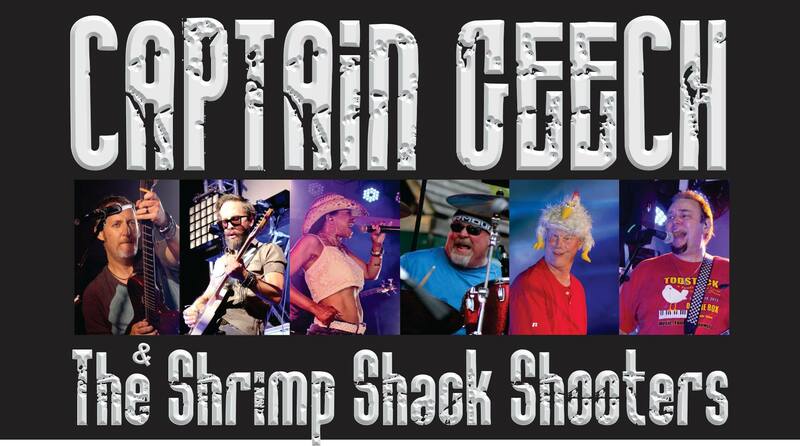 Armed with an arsenal of 70’s & 80’s radio “Top 40” songs, Captain Geech & The Shrimp Shack Shooters is a trip back in time entertaining all ages. An “in your face” approach of non-stop musical favorites, one after another, with barely enough time to catch your breath from one song to the next. Captain Geech is just fun, and is a favorite everywhere they go!